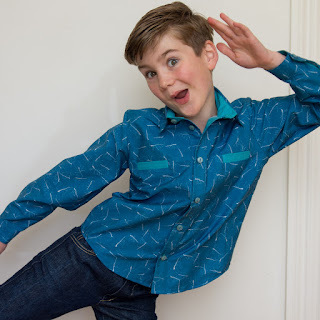 Once I'd sewn up the boy's School Concert outfit and saw again what a gorgeous, appreciative little clothes horse he is, I couldn't help myself.... I went on a cutting rampage and cut out a shirt, another t-shirt, more jeans and a pullover. All for him! 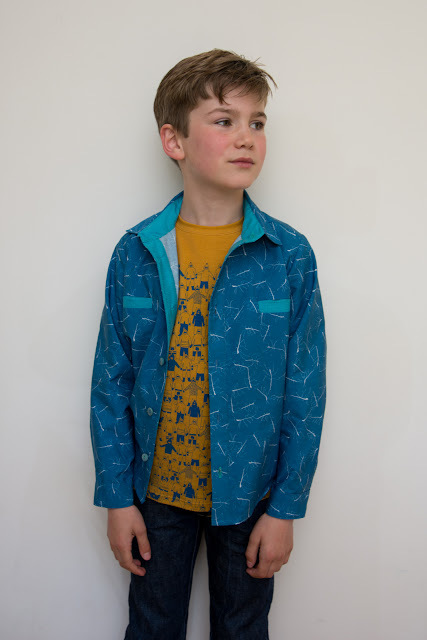 The second pair of jeans and the pullover are yet to be photographed, but it made sense to start with the shirt and t-shirt as both fabrics are by Zonen09 via the Maaidesign shop. 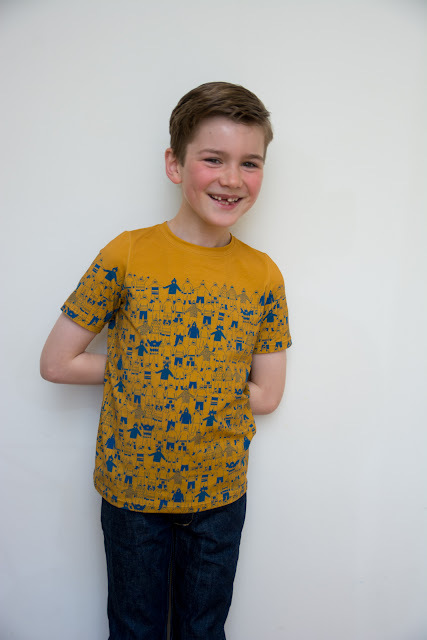 The t-shirt fabric is a knit panel called Cool Flakes in the Rust colourway. 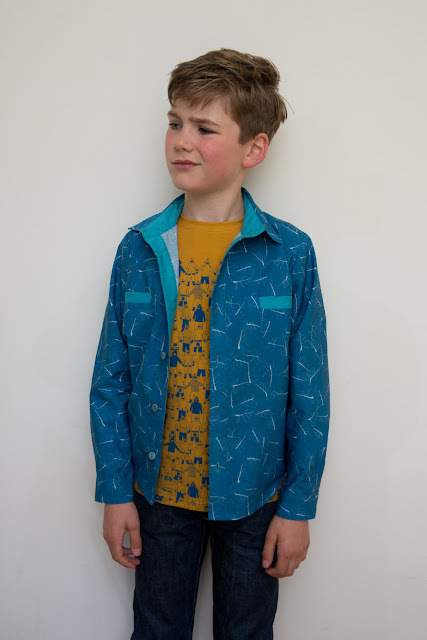 Out of a single panel it's easy to cut a kids t-shirt and there's enough left over to do the front panel of another t-shirt and colour block the rest. With a long torso-ed bloke like Flipper I don't think an adult t-shirt would be possible from one panel. Perhaps a raglan, but definitely not a regular tee. Shorter guys will get more mileage from their yardage! It's a lovely quality cotton lycra and was very pleasant to sew with. 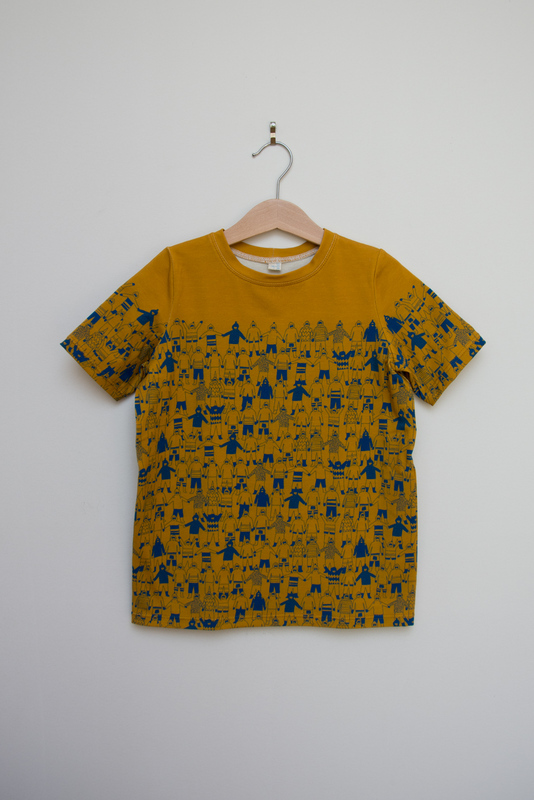 The pattern is the Oliver + S School Bus Tee in a straight size 8, same as the recent white one. This time I used the same fabric for the neckband, for lack of a matching ribbing, and it behaved perfectly. 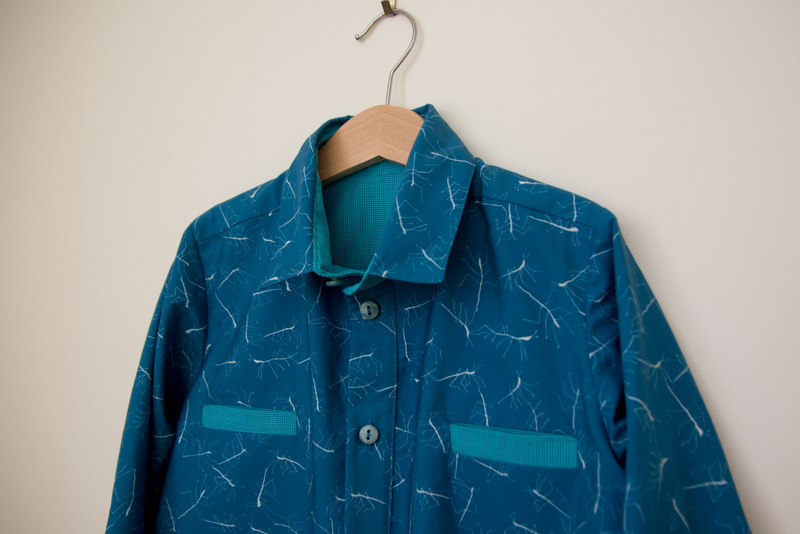 The shirt fabric is also a Zonen09 fabric and I LOVE it. I bought it a while ago intending to make P a long sleeved shirt but kept putting it off. I'm glad I did 'cause over time the idea came to me to add welt pockets, split the collar, cuffs and plackets and use some contrast fabrics. Overdo it, that is, but hey, it worked! The fabric is called Stickly Rockers and what looks like little squiggles from a distance are bugs up close! It's a lovely blue that is really hard to get to look right on the computer screen, and is obviously not any kind of "normal" blue as it was also really hard to find a good co-ordinating thread to sew with! The aqua mini check fabric is something I picked up locally and really cheaply, ages ago and have never known what to do with. It looks too much like school uniform fabric to be much use on it's own but I love it here. This is the kind of colour mis-matching that I never think to do but love it when I see others do it. The pattern is essentially the Oliver + S Sketchbook Shirt with some modifications. I made a size 8 adding only 1" extra length to the body. It is a short style and I knew it didn't need to look like a formal shirt, or ever be tucked in. The sleeves didn't require any extra length (surprise!) but of course at the rate he grows it won't be a long term proposition! The most obvious change is the addition of welt pockets. I just copied the pockets straight across from the Art Museum vest. For next time (ha, like I ever refer back to my own blog) I'd move them slightly in from the shirt pattern's pocket markings. Also, the pocket bags can be visible if he wears the shirt open so maybe it's better for a more formal shirt which will always be buttoned up. I cut the sleeve cuff and front placket pattern pieces in half, then added seam allowance on so that I could have my contrast fabric on the inner cuff and inner placket. I also decided to split the collar so that I could have a two-piece collar and get the contrast fabric snuck in for the collar stand. I know that deserves more of an explanation but I can't show you, and I can't explain why I can't show you (nudge nudge, wink wink). A bit of corded piping across the back yoke seam. 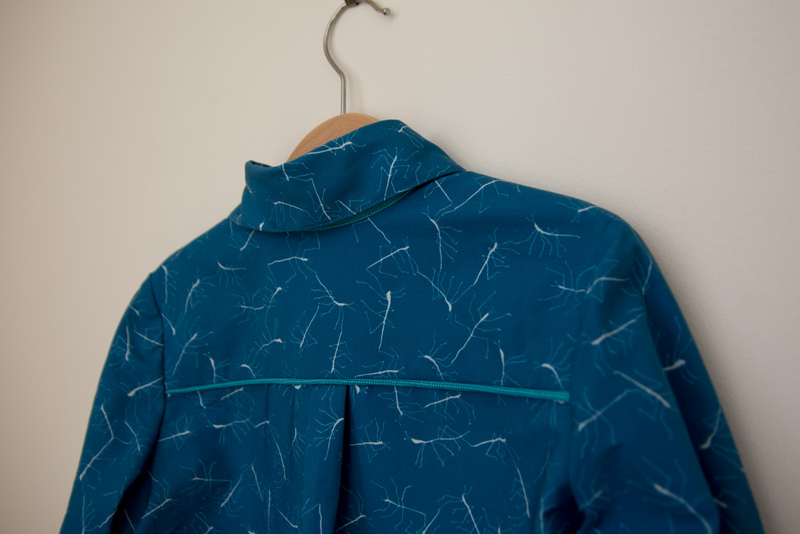 This was a really fun shirt to sew. 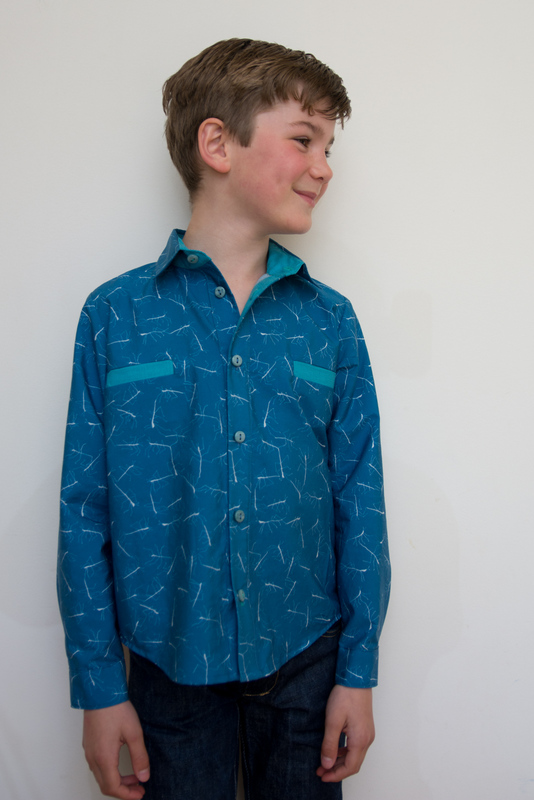 The shirt pattern's instructions are great, and all my tweaks worked nicely without any headaches or unpicking. I love how it looks with his Burda 9406 jeans, but it also looks great with a pair of Art Museum trousers (one year on and they still fit really well). I need to take this boy out to the theatre more often before he outgrows his one "good shirt". I cull the shots where he moons the camera! He is so easy as he'll wear whatever is in the drawer and appears not to really think about it. I could bury the girl's favourite clothes under a huge pile of equally worthy garments and she would still hunt them out! "I cull the shots where he moons the camera" just made my day. 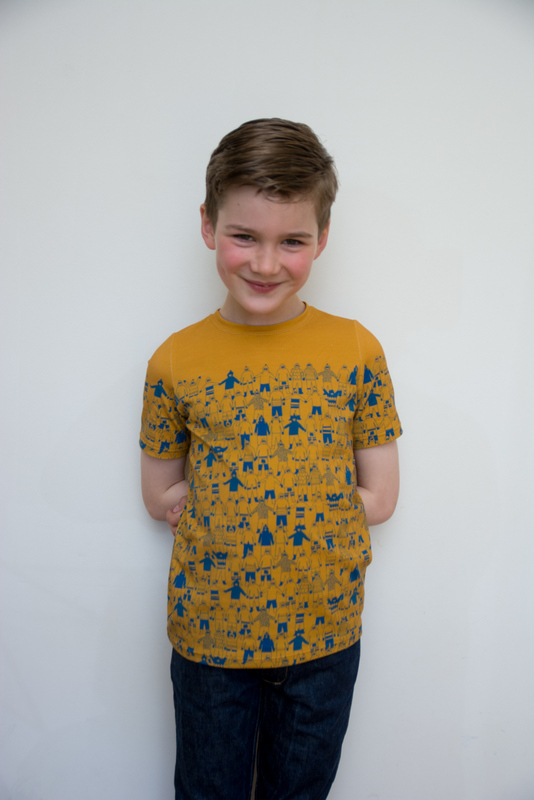 The School Bus tee is (of course) really cool, but WOW that shirt!! I am loving the fabric you used, and those welt pockets are amazeballs! I am also super impressed with those plackets. I must look at this pattern again. Thanks Emi. 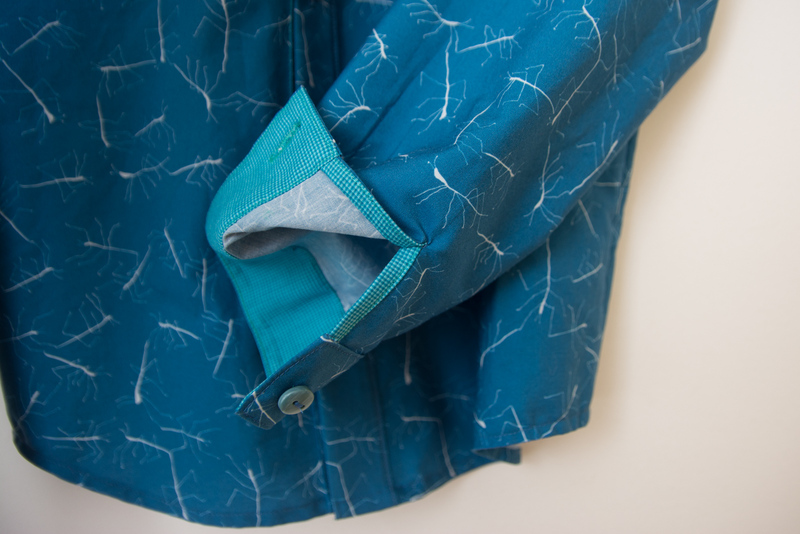 The placket and cuff changes are quite easy. The collar takes a bit more thought. The pattern in its standard state is great. Add length if you want a standard shirt fit. The instructions for the sleeve placket are superb. Everything about this is SO GOOD, Shelley! I am in love with these fabrics, and he really is gorgeous (and appreciative?!?!). 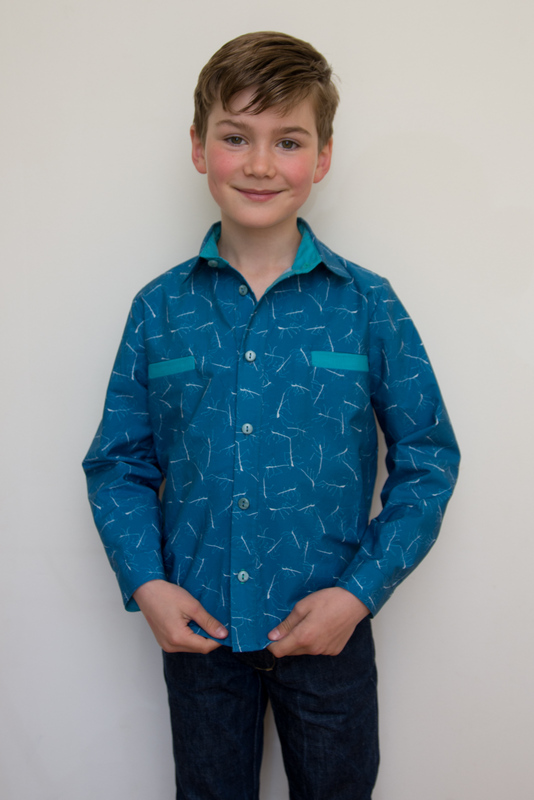 :-) I love the welt pockets on the Sketchbook Shirt and I love the contrasting fabric you chose, it's perfect. I have a personal theory that teal/turquoise and magenta/purple are the hardest colors to match as far as thread. I am not exactly sure why that would be, but it is my lifelong experience. For whatever reason there is just an enormous variety of tones in those shades, and colors don't blend in well (you can't simply choose a darker color and be done with it, the color will be noticeably too yellow or too brown or too something). Am I making any sense? Is this a figment of my imagination?? Do tell. These are they blue, are they green shades though, they really rock my boat! What a fab outfit, those pockets are genius. Thanks Nicole! I'm quietly pleased with myself for thinking of it, but I suspect there must be a way of making them neater from the inside. Thanks Kobi. You should ask your mum to make you one! :) Or maybe to use her own blogger profile when commenting on sewing blogs. he he. Quality work again, as usual! ;) And great photos, looks like he is really enjoying this modelling! He looks really happy, that's what we do it for right? 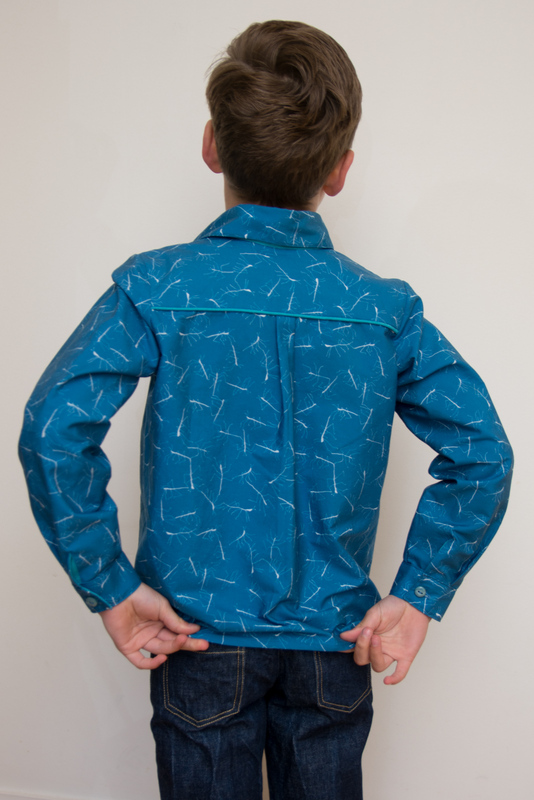 Very smart shirt with the addition of the welt pockets and contrast fabric and the t-shirt is fun. You should be very proud of the garments.